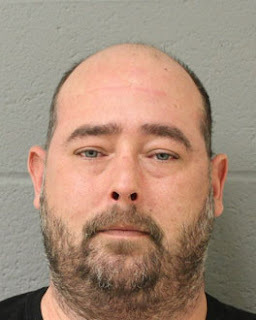 On 21 January 2017 Jewish liquor-store owner Scott B. 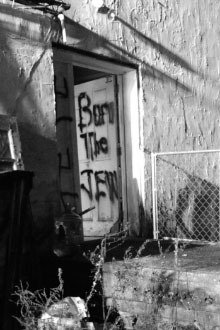 Young started a fire in his own store, broke the display-window, and spraypainted the words "Burn the Jew" on the back door and two swastikas (see photo) next to the door. He then told police that two bearded men in black had robbed him at gunpoint, then started the fire and shut him in the store, spraypainting "Burn the Jew" on the back door as they left. He said that he had escaped the fire by breaking the display-window and climbing out. On 24 January the Jew filed an insurance-claim. Thus it was Jewish lightning as well as a fake anti-Semitic incident -- two great Jewish traditions combined. This particular Jew was not so clever, however, since he left the used can of spraypaint under his counter, and could not even devise an explanation when police found it. And, although he claimed that he had climbed out through the display-window after breaking it, shards of glass and other items on the sill were undisturbed. Police also noticed, contrary to Young's story, that the door had been open when "Burn the Jew" was sprayed on it. By presenting himself as a survivor of an anti-Semitic attack, the Jew obviously hoped to give himself a sacrosanct status that would discourage scrutiny of his fake insurance-claim. This is the Holocaust reparations scam in microcosm. The ADL did get involved (J. Voket, Newtown Bee, 24 January 2017), and there was moral grandstanding about the supposed hate-crime in local media ("Not in Our Town," Newtown Bee, 26 January 2017) -- which in some jurisdictions, it is easy to imagine, might have deterred the investigation -- but the Newtown police nonetheless conscientiously followed the evidence and arrested the Jewish hoaxster.